GENTLE BEGINNER: Traditional yoga poses, linked together with gentle flowing transitions and breath to movement. Improve your focus, strength, flexibility, balance and coordination by practicing the asanas (poses) in this class. A perfect introductory class for the beginning yoga student to help establish their practice, or for any yoga student who wants to work to keep their body and mind strong. RESTORE: Focuses on gentle, deep stretching and holding of healing yoga poses (with optional props to deepen the postures). Enjoy a slow, relaxing flow of movement and breath, while practicing to calm meditative music. Incorporates breath work and meditation. You will truly feel relaxed and rejuvenated after this class! I am eager, excited and passionate about sharing my yoga experience with my students. Yoga is an ancient practice, and encompasses a huge spectrum of philosophy, breath, movement and personal responsibility, to care for oneself and others. It is my personal goal to share yoga with students of all ages and abilities. Whether in one of my group classes or in a customized private yoga session, I am committed to promoting my student’s personal growth, within their yoga practice. Pam is Yoga Alliance certified as a yoga teacher, having completed and graduated from a 200 hour teacher training through CorePower Yoga. She has also completed training, and is certified in the teaching of Restore Yoga. 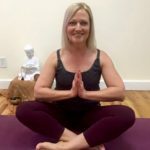 Pam has intensely practiced yoga for the past 12 years in California and Utah, having attended and led many varied retreats, workshops and classes over this time. Pam is also a certified Level One Reiki Practitioner and is certified in Deeksha Meditation. Pam feels that yoga is something that can be practiced by anyone of any age and ability, and that any student at any level of practice, can feel the benefits of yoga; mentally, physically and emotionally. Pam enjoys teaching all types of students and many kinds of yoga, with her passion being the teaching of Gentle Beginner and Restore Yoga. Pam’s gentle yoga classes are beneficial for students at any level; and are perfect for students who are new to yoga, students with physical limitations, older students or anyone coming off of an injury. Pam’s classes aid students in improving their emotional and physical health, strength and focus. Pam includes Breath Work and Meditation in her gentle yoga classes. Pam’s classes offer students a taste of many aspects of yoga; the physical practice and beyond.